Coloured etching with aquatint of a Hindu Pagoda and House by Thomas Daniell (1749-1840) no. 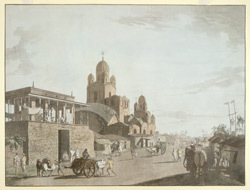 4 of his 'Views of Calcutta' published in 1787. The Black Pagoda was built on the Chitpore Road in 1731 by Govindram Mitter (1720-56), a wealthy Hindu landlord. The building was never properly completed and decayed so much over time that the main tower with five domes collapsed around 1813. Chitpore Road is situated on the northern outskirts of Calcutta.